Lately there’s something new in Collingswood that’s transformed my neighborhood home. It’s a smell, one that picks up around 10 p.m. and lasts until well into the next afternoon. Like zombies, every night, my husband and I find ourselves slowly stalking toward an open window for the best source of the scent. In the seven months since Macona BBQ has opened its doors, the smells omitting from its backyard smoker continue to allure hungry diners. So it was about time I paid another visit to see how things have progressed under the watchful eye of chef Cory Reuss, who opened the eatery last summer with his wife Natalie, an industry pro. The dynamic duo met in Austin, a town crawling with pitmasters who obey the laws of low and slow cooking, and along with a tiny team in the kitchen, the Reuss’ have been able to bring a piece of Central Texas to South Jersey. But where Macona really shines is with its international approach to barbecue, using creative seasoning blends from around the world, from masala and Caribbean jerk to Chinese five spice and Moroccan flavors. But be forewarned, if you want to grab yourself a plate, act quickly as this spot has a habit of selling out every day long before closing time. When it comes to entrées, you can take your pick from a variety of meat platters, including two-and-three-meat options, as well as sandwiches and standalone plates without sides. They also regularly feature a smoked seitan, a little nod in homage to the former vegan bakery that once occupied their space. Macona forgoes smothering its ribs in sauce in favor of a dry rub that works perfectly with each bite. The ribs are big, meaty and possess a smokiness that pierces through the pork to enhance the spice blend on the outside. However, the pulled pork was a bit dry, and served more as a vessel for sauce, as it was short on its own juices. While the seasoning of the meat wasn’t overly distinguishable, the collection of custom-made sauces worked well with the pork to give it some needed oomph. The smoked half-chicken is easily the most reliable and consistent menu item. No matter what spice it’s rubbed with on any given day, you’ll get a juicy portion of meat with plenty of crispy skin and just the right amount of smoky flavor. It’s made even better when paired with the white barbecue sauce, a creamy classic that adds just a bit of vinegar and a little extra fattiness. More than any other item on the menu, brisket celebrates the meat in it’s most pure form, as its most commonly served with a simple black pepper seasoning. When you get the right mix of tender beef, fat and flavorful bark it’s a celebration of what is so great about barbecue: indulgent, textural and meaty. Sausages are probably the most diverse regular offering, made using different meats and spices to create unique products every time. Be it kielbasa, chorizo, lamb merguez or the classic pork variety, they are all enhanced with lots of fresh herbs and ingredients. The sides are a menu on their own, with plenty of regular options and a few specials thrown in for good measure. Every entrée comes with house-made cornbread, a dense muffin filled up with corn and some sweet touches. Meanwhile, the deviled eggs are a dish that shows up from time to time and like the meats, they are served in different varieties and flavors, but are always creamy, rich and wonderfully seasoned. 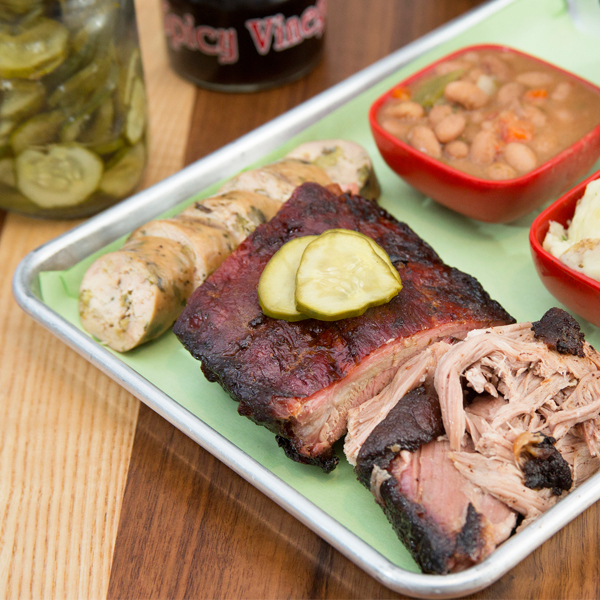 Even a side of barbecue beans adds its own playful twist. Borracho (or drunk in Spanish) are beans cooked in beer and served with a bit of a toothsome bite in a looser, light-colored sauce and loaded with fresh veggies. They are a must-order side dish along with the house-made mashed potatoes. The potatoes are packed with cheese and garlic and provide the perfect base to mix with beans or pile high with meat and sauce. What keeps me coming back—besides the truly outstanding customer service as soon as you walk in the door—is the dedication to creativity. No day is the same at Macona. Spices, specials, even sides have a twinge of something new, making each meal an experience and adventure. This tiny block of Haddon Avenue stood quiet for some time and has suddenly burst to life with flavor. You never know what you’re going to get at Macona, but you can trust that it will be good and smoky. 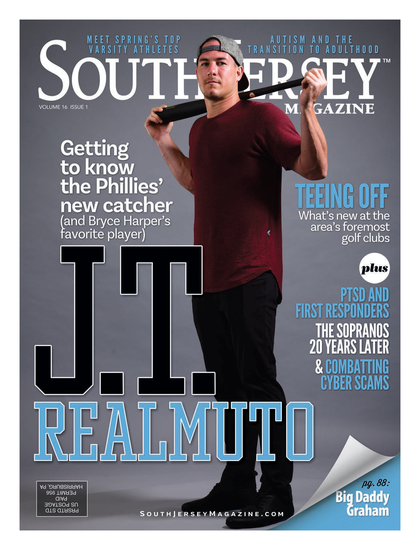 To read the digital edition of South Jersey Magazine, click here. Published (and copyrighted) in South Jersey Magazine, Volume 15, Issue 11 (February 2019).